An erection is a very complex process that involves the cardiovascular system, the CNS, hormones, etc. So coming up with a "cure" is not a simple thing as the Big Pharma companies have found out. That said, cures are certainly not impossible and a number of men on the Peak Testosterone Forum have enjoyed remarkable success. On this page I've documented some of the best ones that seem to match well with the current research. And the beautiful about these cures is that they are natural or almost entirely natural. You'll see that the majority of the solutions below are using foods and very basic supplements for the most part. 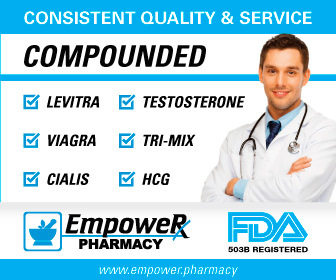 So if you can solved your erectile dysfunction without resorting to pharmaceuticals, this is something definitely worth considering in my opinion. Sure, it's easy to pop a pill, but lets take the PDE5 inhibitors: they affect other PDE systems in the eye, brain, ear and stomach. Can you really say for sure that these will not affect your long term health? (For more information, see my page on PDE5 Inhibitor Links. So, again, check out the Forum-Posted Natural Cures for Erectile Dysfunction below. NOTE: No, these will not work for all men. And, yes, you should always clear it with your doctor first, especially if you have a medical condition or are on any medications. 1. Nitrates + POM Juice. High nitrate foods can provide a man 35+ years old and over with a nice alternative boost of nitric oxide. This can really make a big difference and I discuss how they dropped my blood pressure by close to 10 points in this page on Boosting Your Arterial Nitric Oxide with Higher Nitrate Foods. One of our forum posters got the idea to synergistically add another superfood, or in this case a superdrink, i.e. Pomegranate Juice. 2. Exercise, an Increase in Calories + Citrulline/Arginine. I have a few cautions about this poster's protocol, but it is very interesting nonetheless. The key points here are that the poster had gone too low in calories, which can lower testosterone and thyroid function along with negatively impacting erectile strength. So adding in the calories may have been all this guy needed to do as you'll see below. However, he is doing a lot of lifestyle changes anyway, because walnuts, POM and brown rice all increase nitric oxide! In addition, exercise increases nitric oxide for several hours and, if you do it with enough intensity and duration, it raise baseline NO levels as well. (Don't overtrain though!) So check out his protocol below. "DIET/SUPPLEMENTS: I cut back my L-arginine in the morning from 5g to 2g and upped my L-citrulline from 1g to 2g (1g dose at a time twice daily) Added powered cacao to my morning shake. I moved drinking the POM in the morning instead of grape juice. Started eating TONS more in food volume (I'm skinny and was averaging less than 2000 cals/day. Now I'm forcing myself to eat closer to 3000 even if I'm not hungry). The major foods added were 4 eggs daily (2 morning/2 evening hardboiled) and 1 cup (prior to cooking) organic brown rice split between lunch and dinner. I'm also eating a few Walnut and Brazil Nuts daily (usually in the evening). " "EXERCISE: I bought a bench/weight set and started some basic lifting (using roughly the StrongLift 5x5 program as a guideline) 3x week Quit running and instead am doing various kinds of indoor cardio 2x week 1/hour each time I should also mention that I've been doing Kegels twice daily for about a year now and can hold 2 sets for 10 seconds easily where I couldn't even hold for a second when I first started." Now my caution with what he did has to do with citrulline and arginine. Citrulline is quite new, relatively speaking, and I think caution is in order when it comes to long term use. Many men have used it on the forum without any side effects that I know of. However, long term effects is another story. Arginine is definitely not something I would recommend: it likely increases outbreaks of all herpes viruses, including Epstein-Barr, HSV and HPV. I have gotten a shingles outbreak on my back taking Arginine for example. See my page on Herpes and Arginine for some more details. NOTE: One thing that can really help almost any man 35+ is to clean out his arteries. As I mentioned, most begin to lose their baseline arterial nitric oxide due to arterial plaque buildup and the ensuing damage to the lining of their arteries. If you clear that plaque out, you can get increased blood flow and nitric oxide. For more information, read my pages on How to Clear Your Arteries . And another reason to do this is that, if you do have plaque, it can go rapidly downhill and we all know where that leads: angina, stroke, heart attack and the unmentionable in some cases. And men with erectile dysfunction typically have plaque. "Hello. I'm 38 an healthy. I smoke weed an cigs. I have had problems with erections since I was 35. Some days good some days bad. Tried just about everything to help my erection. Nothing really helped. I till now I am a new man! Like I'm in my 20s! I started taking vitamin c about 2,000 to 4,000 milligrams a day. Saw a huge difference in erection! That was great! But I just found a breakthrough! Vitamin c works really well for erection, but take vitamin c with garlic an omg hard one like your 20. Rock hard. I was researching vitamin c when I stumbled upon an article. About researchers giving men in there 50s vitamin c with garlic. And it boosts nitric oxide by 300%!!! So I tried it an this us it. This is the combo that will fix you. It fixed me. I started taking both about a week ago. An I haven't been this happy for long time. It works so well that I don't think I could get this hard when I was 16!!" 4. Low Fat Diet + 2 mg Cialis + High Nitrate Foods. This has been my formula to eliminate my erectile dysfunction. Basically, a low fat diet (10-15% fat calories) coupled with good foods and a small dosage of Cialis has going strong even though I am about to turn 55. Now, to be honest, I don't really want to be quite that low fat. I love dark chocolate and nuts for example. If you put me in a room with a bag of train mix, I might not come out the winner. However, I have learned time and time again that I cannot consume any significant amount of fat. People like to talk about "healthy fats." But I can only tell that for me, they just slow down my blood flow. Notice that he commented that ZMA - a combination of zinc, magnesium and a B vitamin - greatly helped his sleep. This is probably due to the increased magneisum, which is known for improving sleep in many men. And magnesium deficiences are quite common, due to soil depletion and poor diet. The citrulline, of course, helped him via a completely different mechanism: it increases arterial nitric oxide. This is very interesting considering that this is a guy less than 40 and around half of even young guys have significant arteriosclerosis according to a number of studies. In other words, young men very often now need an nitric oxide boost due to the ravages of a Western lifestyle. 6. Just Vitamin C. One poster completely restored his morning and daytime erections just by taking Vitamin C. Unfortunately, he does not say how much he took, but most guys are in the 500 mg two or three times per day category. This is what I call a nutraceutical solution, i.e. a natural food, drink, supplement or herb that solves a medical condition or significantly improves health. And straight Vitamin C does that for many men, since it lowers "stress reactivity", i.e. keeps cortisol from rising too high and Vitamin C Increases Nitric Oxide as well. CAUTION: Dr. Blaylock recommends taking this on an empty stomach as it can increase iron absorption. You want to take one of the "Ester-C" forms as straight ascorbic acid is quite acidic. NOTE: We other more pharmaceutical-based cures. For example, one senior man used a combination of Citrulline, Arginine, Cialis + Doxazosin, alpha blocker, to get his erections back. Again, I'm trying to give more natural solutions in this thread. 3) Oxidative Medicine and Cellular Longevity, 2013, "Research Article Neuroprotective Effects of a Variety of Pomegranate Juice Extracts against MPTP-Induced Cytotoxicity and Oxidative Stress in Human Primary Neurons"